SysExporter allows you to grab data from most static windows that appear on your computer. This is useful for getting error data, instructions and more from system messages that you would ordinarily have to type out or screen capture. This versatile tool can grab standard list-views, tree-views, list boxes, combo boxes, text-boxes, labels and Web Browser/HTML controls from almost any application running on your system. The program can export its data to a text, HTML or XML file. How to extract: Download the ZIP package and extract to a folder of your choice. Launch sysexp.exe. When the 'Add Column Headers To Tab-Delimited File' option is turned on, the header is now also added to comma-delimited files. *Extremely* important tool for software testers. Getting lengthy error messages out of static windows is critical to helping developers understand what went wrong. If you want to help any of the makers of software on this or other sites, start with SysExporter. v1.50 now has a drag and drop button taht you drop on the window you want to see the text from. It makes this very valuable the tool so much easier and intuitive to use. An excellent upgrade, imo. Unfortunately, it still does not seem to handle Outexvlb type listboxes. 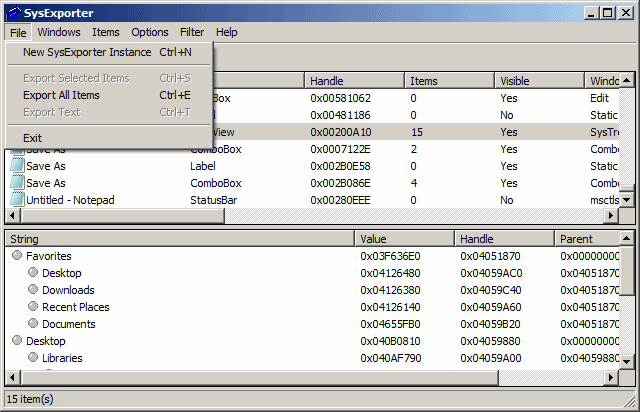 is there a way for this program to read an Outlook (not outlook express) address book listbox of type OUTEXVLB? I do not get anything at the bottom of the screen. I have tried it with around 200,000 items and with about 800 items and nothing shows up. Is it because this program does not support this particular listbox/window??? This program is absolutely essential to the way I do business in my office. I regularly need to pull, codify/classify, and manipulate file data from internal servers (actually net drives), and this little baby does the trick every time. LOVE it. Comment from Loner is out to lunch; if you don't see a use for it, you don't need it. If you have a use for it, it's a godsend. Is NirSoft one guy? Sweet lord, he's productive! Didn't recon I searched for this all the time till I found it by accident. Now it has a fix place in my Admin-Toolbox. Thank You ! useful program only if you know what youre doing, disregard what "loner" said. You have to do the search or whatever in Windows or the application first, then run sysporter and select the results. It is fantastic. Very helpful tool. I do a little AutoIt and VBA programming from time to time and this little tool has come in very handy. I've used it to browse and export data from inside of apps such as Outlook. It's a specialized 'viewer' and text and csv export tool for text that's stored inside of combo or list box. Probably not for everyone but definitely useful and a timesaver if you need what it does and want to avoid the tedium of re-typing text you can see on the screen but can't always cut and paste. All I got was a text version of whatever the tree structure was on any given drive. Seems to be a pointless product with little use for anyone.